Home arrow_forwardDoobert Sayingsarrow_forwardEvery dog should be a rescue dog. Please don’t shop, adopt! Be a rescuer; save a life. Every dog should be a rescue dog. 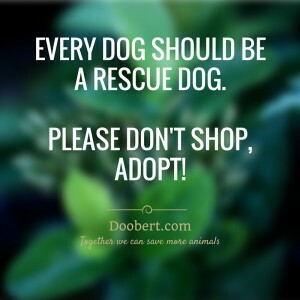 At Doobert.com we believe that every animal adopted should come from a reputable animal rescue or shelter. There are so many loving animals that are looking for their forever homes so please, adopt a rescue animal today instead of shopping from a breeder. You’ll be glad you did. And join us by volunteering to be a rescue transporter, foster home or any of the other ways you can help.